Explore a new story mission where a DedSec op goes haywire and the Russian mafia gets involved. Or if you've ever wanted to protect, serve, or seduce, you'll have several new options to show your talent, as well as new time trials and new weapons set to stun. Hack into the city’s infrastructure, every connected device, and everyone’s personal database. Take control of drones, cars, cranes, security robots, and much more. Hack your enemies and bystanders alike – manipulate them in different ways to trigger unpredictable chains of events. Every person, any vehicle they might drive, any connected device they possess can be hacked. Know a friend who’s got what it takes to join the cause? 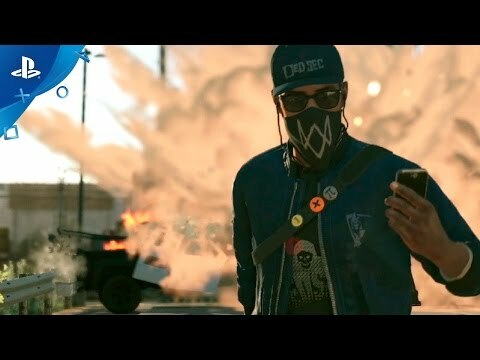 Share the Watch_Dogs 2 experience now using Share Play. Get the ultimate Watch Dogs Experience with the Watch Dogs 2 Gold Edition, which includes the base game, the two Deluxe Packs below, and Season Pass which continues your Marcus’s journey with future mission packs. Get all DLC mission packs 30 days early on PS4™. Ready to take your experience to the next level? Upgrade to the Watch Dogs 2 Deluxe Edition which includes the base game and two exclusive Deluxe Packs filled with premium customization items to personalize your character, weapons, vehicles, drones and more. Team up with Dedsec, a notorious group of hackers, to execute the biggest hack in history take down ctOS 2.0, an invasive operating system being used by criminal masterminds to monitor and manipulate citizens on a massive scale. Continue your hacker's journey with several hours of additional mission content, new co-op difficulty modes, outfits, vehicles, and tons of customization items with Watch_Dogs® 2 Season Pass. T-Bone Content Bundle: Get the style and the swagger of legendary hacker T-Bone Grady with his truck and outfit, and discover a new co-op difficulty mode. Human Conditions: Hack your way through several hours of additional mission content in three new World Stories, and uncover San Francisco's biggest scientific scandals. No Compromise: Experience an all-new World Story which mixes Marcus up in the seedy underbelly of San Francisco - and gets him in the crosshairs of the Russian Mafia. Also includes a new co-op mode. Psychedelic Pack: Customize Marcus' outfit, weapon, drone and car in the grooviest style. Get access to all content 30 days early on PS4. A notorious group of hackers who exposes the hidden danger of CTOS 2.0, which, in the hands of corrupt corporations, is being wrongfully used ot monitor and manipulate citizens on a massive scale. Sitara’s taken full advantage of the education system. She’s studied marketing, psychology, PR, and just about anything related to art, but most of her hacking ability is self-taught. DedSec is her chosen tool to fight back and she’s carefully crafting the SF group in her image, making sure every public message is on-point and every logo packs a punch. She has a mean streak with a sense of humor. She suffers no fools, but she loves to troll them. Her suggestions for where to draw the line often don’t include a line. She believes the system has completely failed, and until it’s fixed, she’s not going to play nice. Josh is quiet and introverted, and maybe there’s borderline elements of that in his personality, but the fact is, he is a genius. Talking to you is just slowing him down and he’s already dispensing with the small talk and harvesting the useful tidbits. He seems impatient, but it’s because he doesn’t bother with beating around the bush. He doesn’t have time for that. He’s also thinking ahead and building devices and machines the group might need down the road, meaning it might look ridiculous now, but there will be a need for his inventions. DedSec knows a guy who is part hacker and full-fledged anarchist. He wears a freaky mask with LED displays capable of bizarre emoticons. He shows up for parties, slipping the beer bottle under the mask. Few people have seen his real face … but he’s cute. He denies it. He’s vulgar, crude, entertaining, and an absolute adrenaline junkie—he lives on the edge. While most of DedSec works behind a screen, this man thrives out in the action and he seems to have no fear. He’s an adrenaline junkie with need to rebel against the establishment, and his energy is infectious. However, the man can cause complications, putting DedSec at risk, and this probably will create conflict at some point. © 2015 Ubisoft Entertainment. All Rights Reserved. Watch Dogs, Ubisoft, and the Ubisoft logo are trademarks of Ubiosft Entertainment in the US and/or other countries.